Nestled in the Beartooth mountains of the Northern Rockies, Granite Peak is the highest point in Montana. As the name suggests, the peak is compromised of massive, jagged granite and is considered one of the most difficult of the 50 state high points. Battling the Switchbacks From Hell, hail on Froze to Death Plateau and incoming storms on summit day, Adam & Sam summited the tallest peak in Montana, Granite Peak. We began our trek at the West Rosebud trailhead enroute to Mystic Lake in early August. After about 3 miles and 1300ft elevation gain, we reached the Mystic Lake Dam and continued another half mile to the Phantom Creek Trail #17 heading south. This is where the long and grueling "Switchbacks From Hell" begin; there are 26 switchbacks gaining 2500ft in less than 3 miles. The switchbacks will take you from Mystic Lake all the way above timberline to a cairn marking the transition to the Froze to Death Plateau. The Froze to Death Plateau is extremely difficult to traverse as there is no defined trail over talus and boulder fields. Make sure you have a good map or compass skills to stay enroute towards Tempest Mountain (11,600ft) where high camp is located near. 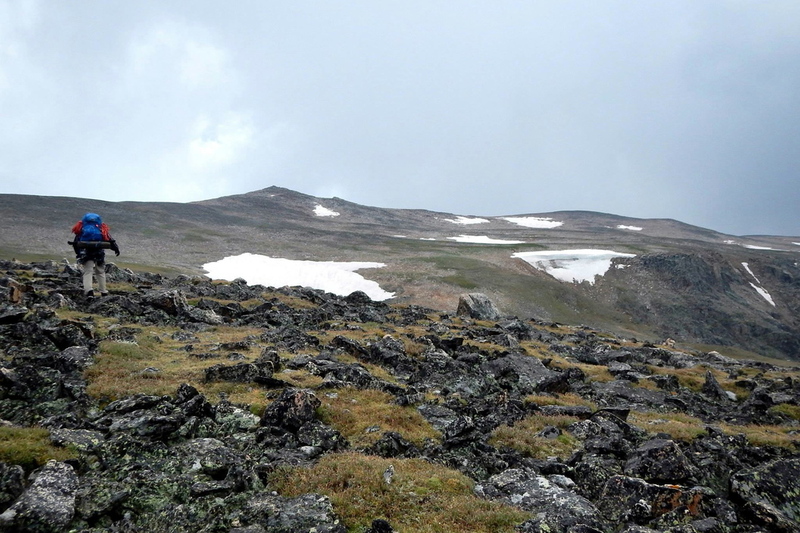 The plateau gradually gains elevation from 10,500ft to 12,000ft. We experienced a heavy 1 hour hail storm on Froze to Death Plateau retreating us to the poor shelter options available. I learned a great lesson from my climbing partner Adam on this trip: always bring a garbage bag on these long backpacking trips for light, easy protection from the elements. The garbage bags worked great keeping us out of the elements. Upon arriving at high camp, we filtered water, cooked dinner and soaked in the beautiful views the plateau had to offer. 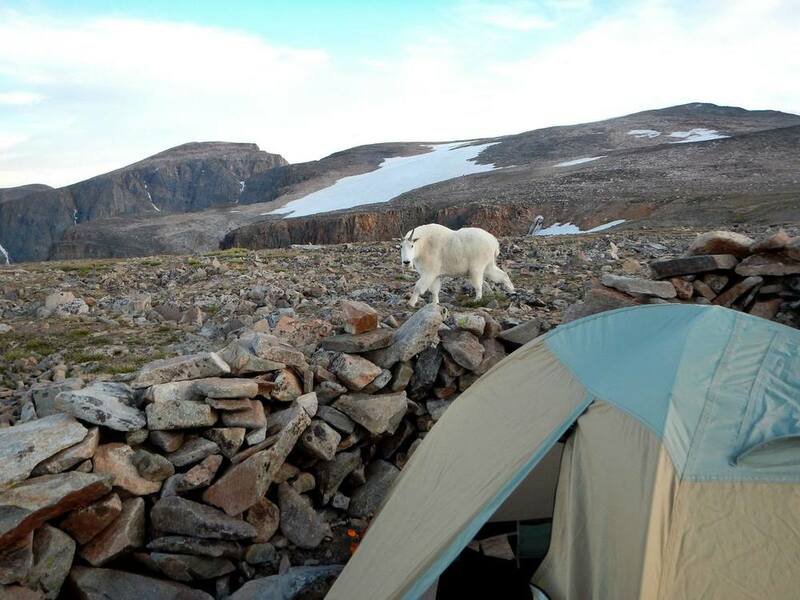 At high camp, making friends with the locals is very easy. Within 20 minutes of setting up camp Adam and I were surrounded by a family of mountain goats and a pesky marmot. The goats enjoyed licking the salt every time we took a leak. Unlike the marmot, they were good company. On summit day, leaving our tent and large packs behind, Adam returned to a his pack with holes chewed by the marmot in search of food. We woke up on summit day at 4am to ensure we had enough time to beat out any potential bad weather. Do not under estate the time it takes to reach Granite peak from high camp. Although at high camp you are at 12,00ft, you lose 500ft on the saddle between Tempest Mountain and Granite Peak before gaining another 1000ft again. We found our GPS to be very useful this trip. After traversing the saddle, we arrived at the famous snow bridge. Some recommend crampons and this is mostly dependent on the time of year. We did not have crampons making the traverse very difficult as there is no flat walking path. The snow bridge drops off on both sides thousands of feet to ones doom. We roped up and carefully traversed. After successfully crossing the snow bridge, the class 3 - 4 climbing begins. Climbing skills are important. Although we did not use our rope for the climb up, I would strongly suggest bringing a rope for the 3 rappels to get back down. Getting down would be very hard without a rope. Route finding can be a challenge. You can keep the climb in the class 3-4 range if you pick your route wisely. We printed off directions from home and brought them with. Climbing can get very hard and dangerous quick if you venture in the wrong direction. Once reaching the top we breathed the noticeably thin air and celebrated our accomplishment by signing the summit log book! From the top you can see a handful of pristine alpine lakes in the distance and the aggressive jagged peaks of the Beartooth Mountains. Granite Peak will go down in the books as our first true alpine climb. I highly recommend this climb.